I’ve talked a lot about how important (and easy) it is to keep up with the literature in your field. Doing this is critical to staying at the top of your game. I’m posting the link to my short video on how to do this using current technology to make it as easy as possible. Core sources – these contain articles that almost always relate to your area of interest. I read 8 core journals each month. Non-core sources – these journals occasionally contain articles important to your field. I read 15 non-core journals monthly. WTF sources – Yes, WTF! (World TaeKwonDo Federation for those of you who actually don’t know what this means). These are things that are totally off topic, but interesting. They sometimes give you a kick in the head and get you thinking about things that could be important in your field. These are very important! I read 18 WTF sources, most of which are updated daily. You can download what Scott Weingart calls “show notes” by clicking here. It summarizes and gives some specific recommendations for things discussed in the video. If you want to see the full list of what I read every day, click here. Please feel free to comment and share how you keep up in your field! Journals have been printed on trees since forever. Within the past 10 years, there has been a shift toward also making this content available on the publishers’ web sites. 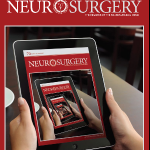 Now, Lippincott Williams & Wilkins (LWW), publisher of the journal Neurosurgery (and many others) has taken an important step forward. Beginning with the current issue (March 2012), this journal is now available within an iPad app. One of the problems with the traditional journal was that you had to go to the library to read it. And medical libraries can’t carry every journal, so if the one of interest was not in the collection, you had to wait a few days for the librarian to get a copy. With the onset of the internet age, journals began to appear online. Most major publishers had a web presence and made their journals available online. However, most provided full text content for free only to their subscribers. At best, a non-subscriber would get the abstract, or an occasional free article. Biomedical libraries typically subscribed to services where hundreds of journals were available as full text to medical staff members, residents and students. The downside was, and still is, that you need access to a desktop to comfortably consume the articles. The web sites were just not that friendly for the small screen. Finally, LWW has made a concerted effort to provide this content in tablet format. More and more trauma professionals are carrying these devices and using them in their practices. This brings the content closer to the patient and provides it in a very consumable format. It also allows the publisher to add dynamic digital content (audio and video) to the material. Portability is excellent. A continuous internet connection is not needed. The entire journal issue is downloaded and added to your library, and you are only limited by the amount of storage on your iPad. Extra digital content is routine. And since it is already downloaded with the issue, there is no waiting for it to load. Articles have the same look and feel as the journal and can be panned or zoomed for readability. Content sharing is possible (somewhat). Each article allows the user to share on Twitter or Facebook. The article can also be emailed to others. However, only a link to the article is provided, and if you are not a journal subscriber you’ll either have to pay up or use your medical library account to get full text when the link is opened. What doesn’t it do? There is currently no ability to search through an article or issue. And it would be nice to interact with one of the authors via an email link to ask questions or make suggestions. Finally, Apple is not the only tablet maker out there. Publishers will need to make sure apps are available on the Android platform as well. Bottom line: This is a great first-try at moving journals onto a mobile platform. I expect that LWW will begin to roll out this format for all their journals since they’ve now figured out how to do it. And expect all the other publishers to jump on the bandwagon as well. Journals are eventually going to go the way of DVD movies, and we’ll end up streaming our professional content from some company with a big red logo. Reference: Search for “Neurosurgery” in the Apple App Store.